Remember me telling you about planting grass seed along the walkway earlier in the Spring only to discover the Pres "raking it in a little better" when I came home earlier than normal from the gym? Well, whether it was his touch or mine, it is growing, which is all that matters at this point! 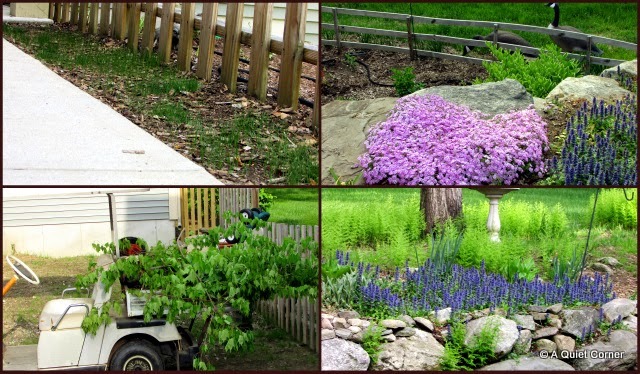 And, as you can see, I have been busy trimming the low lying branches on the trees in the yard, stopping just long enough to enjoy the garden beds. Then this weekend, I sat and DID NOTHING which is when I was able to catch "Red" back at her antics. Does she look pregnant to you? Although, at this time, I am not sure of what life will be like post surgery for the Pres and I, I am hoping that I have some time to blog. I guess we'll cross that bridge when we come to it. However, while I have your attention, I would like to thank all of you for your wonderful thoughts, words and support through it all...:) So, with my hands folded across my chest like little "Red," I thank you from the bottom of my heart. Red is cute and love the comparison to your hands and his. My thoughts and prayers will be with you and the Pres. Jp, your yard is looking beautiful and I love your cute "Red". My thoughts and prayers for you and the Pres! Have a happy day and new week ahead! Red sure is cute and poses so nicely. Even if you can't blog while the Pres is going through his surgery know that I'm thinking of you both and sending prayers . the grass looks good to me and i do think Red might be pregnant. 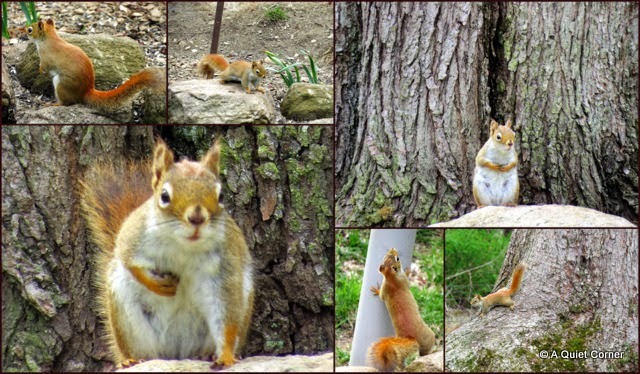 little squirrels are so fun to watch, will give you something to do while waiting with hands folded. As always I had some catching up to do on my blog reading. I just sent up a prayer for you and the Pres. I really think the hardest part with the surgery is going to be keeping the Pres from doing too much afterwards! He's going to feel great and have more energy. You made me laugh out loud with Reds antics and your comments a couple of posts back. I think Red looked pregnant in those posts, but now, in today's post...I don't know. Guess Red will show you pregnant or not soon! Maybe she just likes eating your food too much! As always prayers on speedy recovery for the Pres! You take care of yourself as well. Red may indeed be in the "family way." I wish you and the Pres well. Lovely pictures of your garden and red as well. Positive thoughts with you and the Pres and look forward to good news soon. Little Red looks like a nursing Mom.